What's bright red, luminous yellow and amazingly exciting? No, not your favourite actor covered in custard: it's the new Nokia Lumia 920, a phone so bright it can burn retinas from a hundred yards away. The flagship Windows 8 phone is as good as it looks, and demonstrates that you don't have to copy the iPhone to make something that's immensely attractive. The Lumia 920 is so good that our own Gary Marshall, a man whose iPhone is surgically attached to his hand, would seriously consider buying one if it actually existed. Existed? As Nokia hasn't given us a price or a release date, "it doesn't exist in my world: I can't order one online, I can't play with one in a shop, and I can't get one on a stupidly long and expensive contract. I'll be able to do all of those things with the iPhone 5, possibly as early as next week." For Marshall, "Nokia did half an Apple: it made me look at my current phone and think 'hmm, it's getting on a bit. Time for a new one'. But it didn't do the other half, which is to actually close the sale: where Apple goes 'Boom! This date! This price!' Nokia said 'Hmmm! Not sure! We'll get back to you!'" The 920 wasn't the only Lumia announced: there was a smaller and we assume cheaper handset, the Lumia 820. 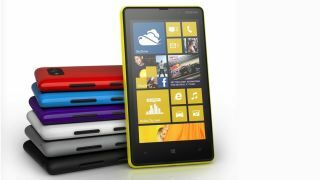 Gareth Beavis was cautiously impressed: "The Lumia 820 will live or die by its price; get this under £200 and there could be a seriously good phone out there, but if it's more aimed at the premium user we can't see why you wouldn't opt for the 920," he says. Nokia wasn't the only giant showing off new handsets this week: Motorola had some new Droids too - and since Motorola is owned by Google, you just know those Droids will be rocking the very latest version of Android. Except they won't, because they're running Ice Cream Sandwich. You've got to wonder what's going on with Android if Google can't get the latest version of its own OS on its own company's kit. OS aside, the new Droid family looks interesting. There's a cheap and cheerful Droid Razr M, and the awfully named Droid Razr HD and Razr Maxx HD, which seem to have been named by eight-year-olds. We can't wait for next year's RAZR OSSUM. So how do the Razrs compare to their predecessors? We're glad you asked, because we've investigated that very thing. The short answer is better displays, slightly faster processors and more storage. Amazon has been busy upgrading too: the new Kindle Paperwhite has a front-lit screen and massively improved screen resolution, making it a must-have for ebook fans, while the Kindle Fire 2 has a faster processor and more RAM than its predecessor - and unlike the original Fire, this one's coming to the UK. Sadly we can't say the same for the Paperwhite, which is currently US-only. That's not all. There's are two new tablets: the Kindle Fire HD in seven- and 8.9-inch versions, with the smaller one coming to the UK in October. Amazon's really pushing the tech angle here, boasting about its twin Wi-Fi antennas, MIMO technology and 1.2GHz dual-core processor. At just £159 for the 16GB model and £199 for the 32GB, unless it turns out to be utterly awful it's going to sell shedloads.